As lack of Oxygen is very common at high altitude areas. But before it becomes severe need to know about the remedies. You need to drink plenty of water as altitude sickness may be due to dehydration as the lungs lose high amount of water vapours at higher altitudes. If you are losing water due to perspiration then maintain a proper electrolyte balance by having some sports drinks. If you are having headache then have one litre water and take the medicine named acetaminophen (Tylenol). 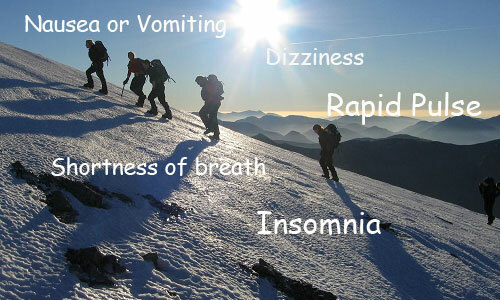 If your headache disappears rapidly then you are not suffering from altitude sickness its just dehydration. Acclimatizing means to get used to a specific climate. It takes some time to Acclimatize in a new climate. Here are some steps to Acclimatize fast. Well the “golden rule” for high altitude Acclimatizing is climb high and sleep low- Once you’ve made your way up past 3,000 metres (10,000 feet), do not ascend more than 300 metres (1,000 feet) per day to sleep. You can climb as high as you want, just make sure that you come back to a base camp that’s no more than 300 m (1,000′) higher than your previous night’s sleeping elevation. This is a useful guideline to keep in mind if you’re driving to a high altitude, as well. If you are not having the enough time for golden rule. Like if you are flying to a destination which is thousand feet above the departure site. Then you can reduce the symptoms of altitude sickness after reaching there. Simulated altitude equipmentthat produce hypoxic (reduced oxygen) air. Portable hyperbaric chambers are especially useful if inclement weather or other factors could make the climb or drive down to base camp impossible. 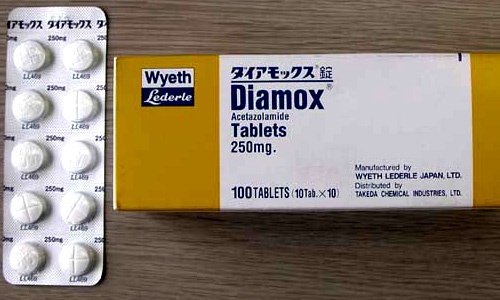 Acetazolamide(Diamox), medication will be very useful as it’ll reduce the recovery time to half and don’t drink alcohol and drink a plenty of water. 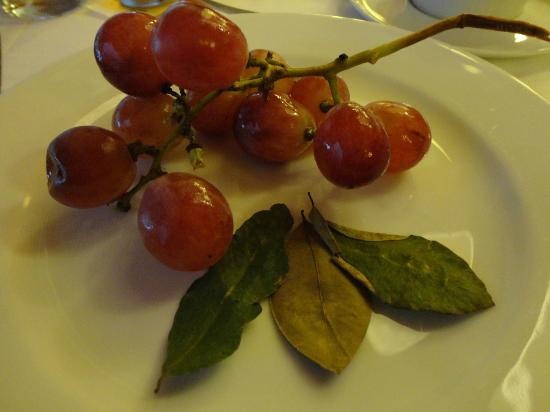 Coca leaves can be chewed to deal with mild altitude sickness. 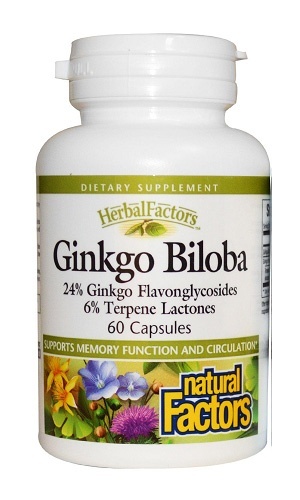 Ginkgo Biloba is fossil tree and an inexpensive herbal supplement. You can use 120 mg per day to reduce the symptoms of altitude sickness. 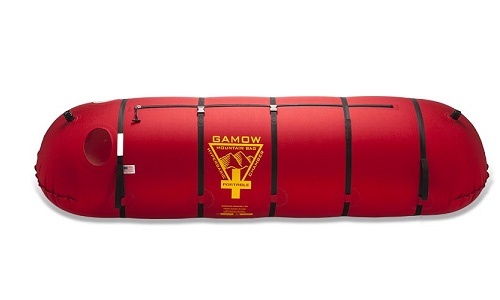 Gamow bag is a portable plastic pressure bag inflated with a foot pump. It can reduce the effective altitude by 5,000 feet. Take it easy. You need not to push yourself too much. Don’t try to breathe too fast and too quick. Resting at the altitude at which you became ill is often the most effective remedy for altitude sickness. You’ll usually feel better in 1-2 days. If you are moving in a car never look in to the valley. As you are not habitual of seeing this kind of scenes. So when you’ll look down in to the valley it’ll look very deep and if you’ll be looking into the Valley when the car is moving it can be resulted in to vomiting whenever you look in to the valley from the car. 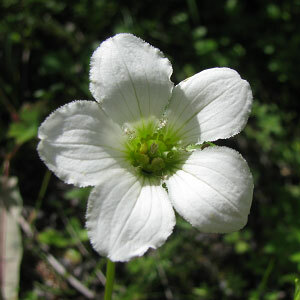 ‹ Will Valley of Flowers open in 2014? When does Valley of Flowers open ? We are reaching delhi on 9 th May and have return flight on 17 th May. We dont organize tours to Kedarnath. Can i get the detailed itinerary including the details regarding the stay, include, exclude, etc. And how many days before do we have confirm our booking? planning to visit in Aug.
All the details are mailed to you. This trip can not be done in for days. Sorry madam. i will make plan probably in august.